Video of the gruesome discovery. Image via LiveLeaks. An Indonesian woman has been cut from the belly of a python after she vanished while tending her vegetable garden. The body of 54-year-old Wa Tiba was discovered yesterday (Friday, June 15) when villagers cut open the 23-foot snake which was found bloated in a village on the island of Muna, off the coast of Sulawesi. A local police chief, identified only as Hamka, said: “Residents were suspicious the snake swallowed the victim, so they killed it, then carried it out of the garden. Previously, about 100 villagers had launched a search for the woman after she failed to return from her garden on Thursday evening. Hamka said villagers found the giant serpent lying about 100 yards from Tiba’s sandals and machete. He added that the unfortunate woman had been swallowed head first and that her body was still intact and clothed when recovered. Her garden was at the base of a rocky cliff, pockmarked by caves, and known to be a lair for snakes, Hamka added. While the serpents have been known to attack small animals, attempts to eat people are extremely rare. However, in March last year, we reported on the discovery of a male farmer in the belly of a reticulated python on Sulawesi Island. A 25-year-old, named only as Akbar, went missing after setting out to harvest palm oil. After he didn’t return, a search party came across a huge snake that had recently devoured a large victim. 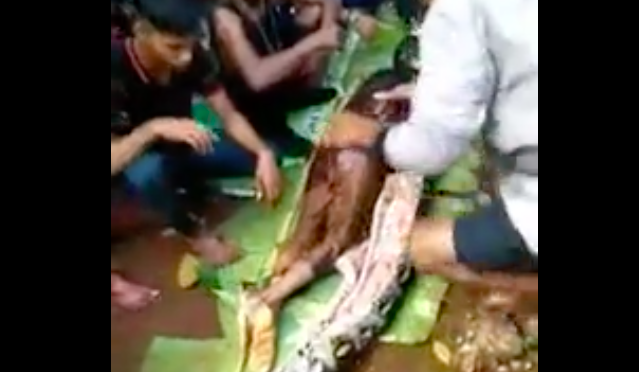 Fearing the worst, the villagers cut upon the 23ft snake and found the man’s body. Reticulated pythons are among the world’s longest reptiles and are found throughout Southeast Asia, including in the Philippines. They kill by suffocating their victims before swallowing them whole. Pythons rarely kill and eat humans, although there are occasional reports of them swallowing young children or animals. The incident last March was believed the first verified case of one eating an adult human. Closer to home, we also reported last year how a Cebu man discovered a 20 foot python in his home, following the gradual disappearance of a litter of puppies. Watch the moment the woman was cut from the python yesterday here. WARNING: Gruesome content.